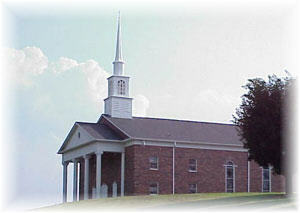 Zion Hill Baptist Church was established on September 29, 1854. The first pastor was L. McCurry. Men who have served as pastors are: A.A. McSwain, J.F. Pendergrass, G.W. Harmon, S.H. Fleming, A. B. Washburn, G.W. Settlemyre, Ephriam Buchanan, A. P. Sorrels, D. P. Lowdermilk, Ralph Melton, Franklin Justice, John Shipman, M.C. Miller, W.F. McMahan, G.A. Condrey, M.A. Nunnally, J.E. Hill, C.W. Greene, Albert Young, George Anderson, Martin Cable, E.F. Sprinkle, Lloyd Gosnell, W.M. Belcher, Floyd Beaver, Dolph Robinson, Kenneth Faulkenbury, O.L. Kuykendall, and Dr. Tom Walker. Brother Walker was called as pastor in April 24th, 1994. Zion Hill Church was originally half way between Sugar Hill Road and its present location. T.W. Pendergrass and Martha Pendergrass donated land to the church in 1903. In 1911 land was given to the church by Mr. and Mrs. J.A. Cannon, and Mr. and Mrs. Lee H. Miller for a cemetery. A new church building was erected in 1949, and in 1960 it was enlarged and remodeled. The first parsonage was built in 1957, and in 1968 it was sold and removed from the premises and the present parsonage was erected on the same spot as the old one. A new sanctuary seating approximately 750 - 800 replaced the old church auditorium. 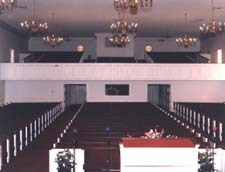 In 1995 a fellowship hall which seats about 400 was constructed. Much of the work on that building was donated by men in the church.